From a renowned year, but reports of La Chapelle being off-form between ’96 and 2002 had lowered my expectations far enough that I didn’t risk taking this to France. 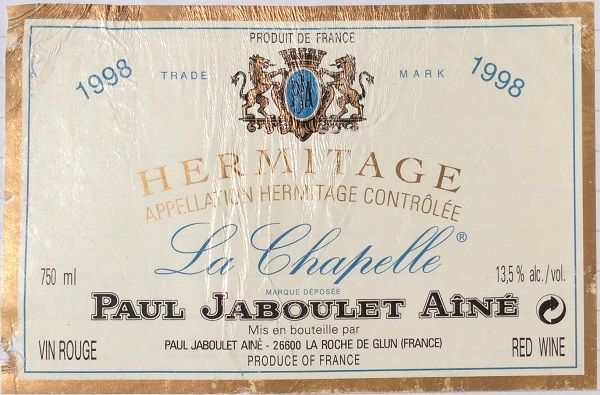 Perhaps I should have, for, although I can imagine that a great La Chapelle might have exceptional length, intensity and complexity, this proved to be a good wine which I enjoyed. Perhaps not great value-for-money, but I’ll enjoy my remaining 2 bottles! Mid- to light depth garnet core with a mid-width brick rim. Developed nose (showing some of the reputed ‘bretty’ notes): beef, tar, sweet spices, a hint of animal, and some black pepper (or am I looking for that note? ), and some ‘dustiness’. Sweet-savoury attack. Good acidity with mature – gentle but slightly dry – tannin. Smoky-spicy palate. Some background blueberry. A dry palate – would I describe it as “minerality”? Moderate length. Pleasant.